See, when was the last time you checked out the where abouts of your Johnny Wockenfuss collection?????????? Oh my god, I REMEMBER Rowland Office cards. What a name that was. I can’t see the image, but the tiny man is probably Donald Davidson, who was the Braves’ travelling secretary for many years, and who was about 4’2″. He used to tell stories of having to check Aaron into hotels using fake names when he was getting death threats. I have this card. 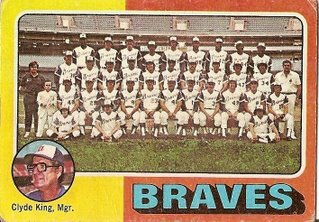 My first cards were ’75 and my peak year of collecting was this ’76 set. Many years later I saw “Brother From Another Planet” and the meaning of Rowland Office was revealed.